Europa Universalis allows players to assume control of a nation in nearly every corner of the world between the years 1444-1820 and try to make it the greatest power around. Initially, Europe had the most unique mechanics nad attention to detail but, with successive expansions, the rest of the world has seen plenty of new content add to it. Mandate of Heaven is one of those expansions that is thematically about a region and it adds quite a few new toys for players seeking to immerse themselves in the Middle Kingdom and elsewhere. While the main features and thrust of the expansion involves new mechanics for the Chinese, Japanese and various other East Asian powers, players interested in playing in other regions also have content they can enjoy. States can now prosper if they are not devastated by war and edicts can be declared, increasing maintenance but also giving players various benefits. Additionally, the game is now divided into ages, each of which has objectives. If these objectives are fulfilled they can give your nation powerful bonuses and ensure that you keep yourself at the top of the world rankings. 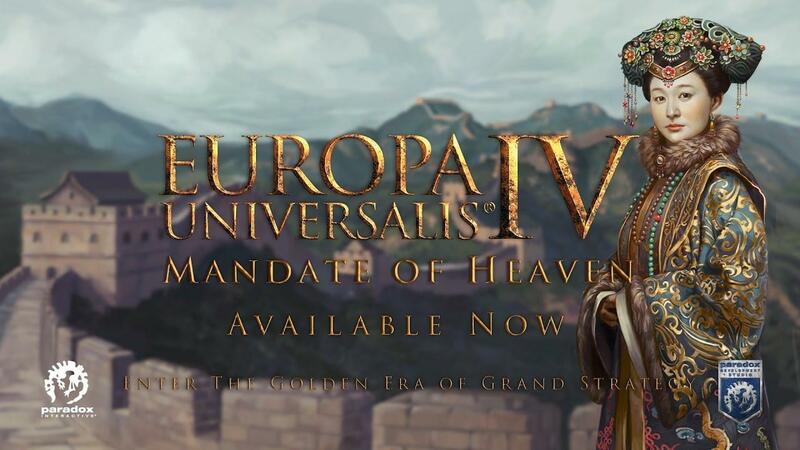 Of course, as with most major DLC releases, Mandate of Heaven comes with a sizable patch. The 1.20 “Ming” update comes with a score of balance and bug fixes but also with several new features. Among the stuff you can expect are devastation mechanics for looted provinces, the ability to declare bankruptcy any moment you have a loan and a new absolutism mechanic which scales according to your choices. You can see the full patch notes here. I was given a key for Mandate of Heaven but, unfortunately, it was on the release day so I was unable to do a more in-depth review of how things actually work. It’s just as well, since I haven’t played EU IV in quite some time and I have to get re-acquainted with the game’s systems. Expect a more complete look at the overall state of the game sometime in the future. You can grab Mandate of Heaven through Paradox’s official webshop or Steam. Both are currently having large sales on all Paradox-published products. EU 4 is good news.But there should be an article about canonical decision, to drop Unity and reducing overall desktop development.How much impact it can have for the future of Linux gaming? Overlord EU 4 is good news.But there should be an article about canonical decision, to drop Unity and reducing overall desktop development.How much impact it can have for the future of Linux gaming? I don't think that will change anything, Unity is just one of bazzillion desktops on Linux, and most users will just try out and switch to other environments. That's what we've been doing all the time anyway. And Canonical don't need to cover entire stack, it's probably better for them to do one job well. This is why I love being Linux user - whatever happens, our ecosystem can usually evolve to handle it. up to 10% market share.But now its back to Gnome and begs the question why unity was ever introduced? All this hard work and effort was total waste.There is Ubuntu Gnome and many other Gnome distros. Culling unity was that necessary? It seems like, there is clear division in Linux community.Just Scrapping unity will not pull the community together.In that case it is clear,Future of Linux desktop is not too bright .And even Distros are free there is donation system and community contributions,But almost Zero liability for the customers.With this Ubuntu and Linux will lose lot of user trust.Many more choices are good but without a spearhead leading front ,future of Linux desktop looks shaky.Now, ppl has almost no reason to abandon stable and mature windows gaming platform even though it has lots of privacy issues. I think once I get some more cash to spend, I'll be giving a bunch of it to Paradox. Crusader Kings II, Europa Universalis IV, Hearts of Iron IV, and Stellaris all have juicy new content that I want to buy! There is only one Mandate of Heaven and it's Might & Magic! Mountain Man I think once I get some more cash to spend, I'll be giving a bunch of it to Paradox. Crusader Kings II, Europa Universalis IV, Hearts of Iron IV, and Stellaris all have juicy new content that I want to buy! I did basically this the last two weeks (yay new job and more disposable income! ). Picked up HoI IV and Stellaris both of which I've been wanting to get since they came out, along with Together for Victory, all the Stellaris DLCs, and pre-ordered Mandate of Heaven and Utopia. It's expansion week for me. Getting this and the new Stellaris expansion. Both of these expansions were things I have been waiting for, more stuff to do in Asia for EUIV and actual stuff to do in Stellaris. Now I can play Stellaris without feeling like it's incomplete. Hmm, might have to get this one. My attempts at a Japan playthrough have always stopped soon due to it feeling... lackluster? But not until summer - must not get distracted from work for the coming 2-3 months. lvlark Hmm, might have to get this one. My attempts at a Japan playthrough have always stopped soon due to it feeling... lackluster? But not until summer - must not get distracted from work for the coming 2-3 months.